Dorthea Dix is best known for helping to establish reforms for treating the mentally ill.
Read the rather lengthy excerpt from the Book of Knowledge below. Summarize how Dorothea Dix thought children should be taught. Why do you think the mentally ill of Dorothea Dix’s day were locked away? 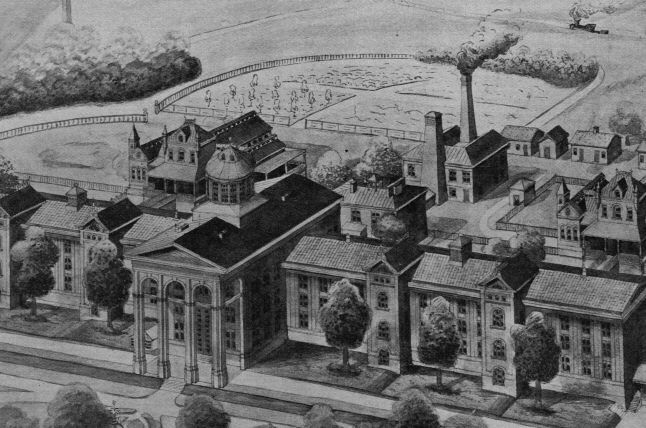 View a photo of the first state hospital in North Carolina for the mentally ill, eventually named the Dorothea Dix Hospital. Narrate in your own words how Dorothea Dix brought about reform for the treatment of the mentally ill. This is the story of a woman who, by a life of self-sacrifice, eased the misery of thousands. Her name was Dorothea Lynde Dix and she lived from 1802 to 1887. She was born to poverty on a small, ill-kept New England farm; but she hungered for education, and when only twelve years old she made her way to Boston, where her grandmother lived, so that she might go to school. In 1821 she opened a school in the dining room of her grandmother’s home. She was the only teacher. The pupils sat crowded around the table, their few books in a neat pile in front of them. Each student had a copybook and a slate, and there was a wet sponge in a dish in the center of the table to clean off the slate when a lesson was finished. The teacher sat at the side of the room and heard the lessons. Such was the usual school of the time. Reading, writing and simple arithmetic were taught, as well as conduct, Scripture, handicrafts such as sewing and lacemaking, and a little science. Dorothea soon found that the easiest way to teach a child was to let his own eager questions — Why is the sky blue? Where does the day begin? and the many other daily questions of bright children — point the way to learning. Diligently she searched for the right books that would answer these questions in a way that a child could grasp. But she found nothing that would do, so she made a children’s encyclopedia, a sort of book of knowledge, almost a hundred years before the first edition of our own Book of Knowledge came into being. While she was still a young woman, a single afternoon’s experience changed her whole life. On a visit of charity to the East Cambridge jail, she was astonished to find insane people there. Bad as the prisoners’ quarters were, the section for the insane was far, far worse. Though it was a bitter cold day, they had no stove or fireplace, no warm blankets or even coats. The food given to the criminals was bad enough; but the miserable creatures whose only crime was mental sickness had but a few crusts of bread. Miss Dix was told by the jailer that insane people do not feel hunger and cold, as other people do. This stupid belief was widespread at the time, but Miss Dix was too sensible a person to believe such a foolish thing. She begged the jailer to place a stove in the quarters reserved for the insane, but he refused. Dorothea Dix took the matter to the local courtroom and pleaded before the judge that some human comfort be granted these poor souls, and her prayers were answered. Here, then, was a cause to which this noble woman could devote her life, her talents, her boundless energies. Throughout the state, locked up in prisons, poorhouses and in sheds on lonely farms were hundreds of men and women in various stages of mental sickness. Some of them were fastened to the floor with chains; others were kept in small enclosed cribs where they could neither stand nor sit in comfort. This cruelty was due to ignorance. Normal people were terrified of an insane person, and their first thought was to lock him up so that he could not harm others…. Dorothea Dix resolved, as her first step in relieving the distress of these tragic folk, to see for herself conditions as they really were throughout Massachusetts. It was a heartbreaking journey. The second step was to write what she called a memorial of her journey and present it to the legislature with a plea for better treatment of the state’s charges. Most people refused to believe her. Investigation proved her memorial to be entirely truthful, and the state of Massachusetts voted to improve conditions at once, by erecting new hospital buildings to care for the insane…. One by one, hospitals were built and, most important of all, ignorance and faulty thinking about the care of [the mentally ill] were changed. Kindness began to take the place of brutality, and medical science came to the aid of those who needed aid so much…. …[I]n 1881, she retired to the friendly walls of beautiful Trenton Hospital, in New Jersey, to live out her last days in peace. This was one of the first hospitals built by her endeavors. She died there in 1887. In her life she brought comfort to thousands of despairing souls and awakened a nation to a sense of its duty. Text of the memorial submitted to the General Assembly of North Carolina in 1848 making the case for a state hospital for the mentally ill. The history of the first hospital in North Carolina established for the mentally ill.
Photo at PubicArtBoston.com of a replica of a fountain Dix funded for horses during a time when Boston’s commerce ran on horse-drawn wagons. Use these tools for creating the comparison of Dorothea Dix’s idea of education with the education of Horace Greeley. The book Miss Dix wrote, considered a sort of encyclopedia. Simple lesson plan at CivilWar.org with discussion questions covering Dix’s work during the Civil War. EduPlace.com map for locating Maine and New Jersey. NationalMap.gov map for locating Hamden. NationalMap.gov map for locating Trenton.